On the left: “nudist jogger”. 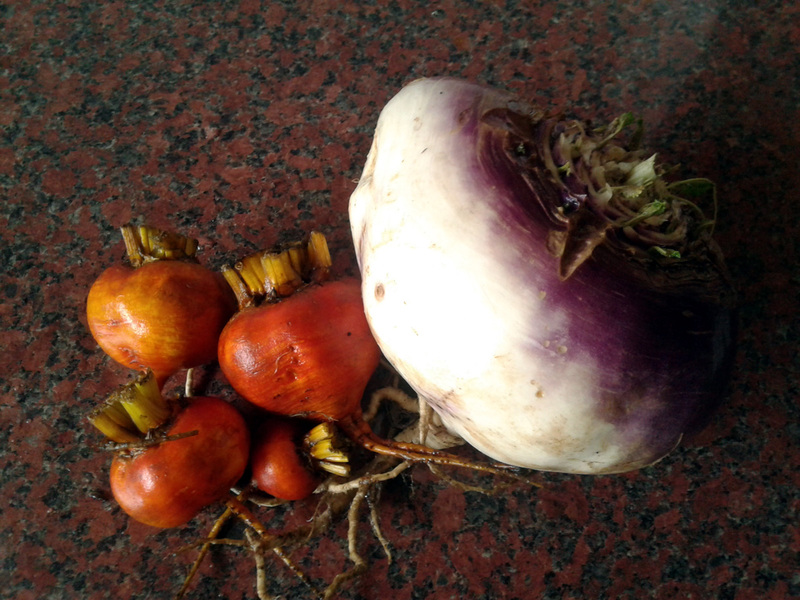 On the right: “carrothulhu”. They still tasted rather fantastic (the knobbliest ended up in a rather nice carrot and cumin soup, as I recall), but that’s been it for carrots ever since. I’ve sown them a few more times and all I’ve ever really grown is carrot tops (apparently they’re quite edible, if you cook ’em right, but I’ve never tried) with short, stumpy rootlings at best. “Why bother?” You might cry, and with reasonable reason. Carrots are around 60p a kilo bag in most supermarkets, so why do I put myself through the hassle and heartache of trying to raise them from seed? The answer, as with so much that’s home grown, has to be: the flavour. Compared to the long-stored, shop-bought versions – and especially the stored-in-the-ground-for-months specimens that are around at the moment – fresh-out-of-the-ground carrots really are a taste sensation. There’s a perfectly good scientific reason why: carrots are biennials. 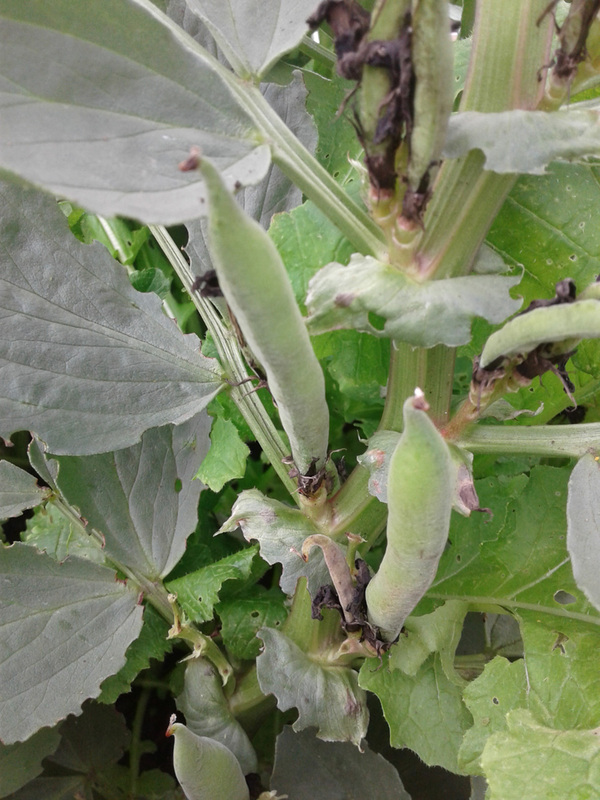 Their roots are storage bunkers for the sugars that the plant needs to keep it alive over winter so it can grow again, set flower and spread seed the next year. 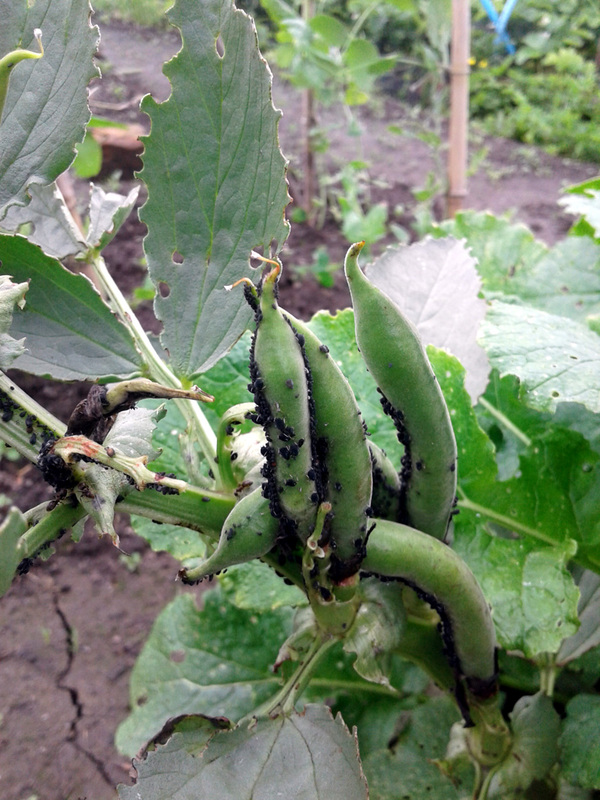 That’s what, if we pick ’em and eat ’em fresh, gives them their sweet, pungent, palate-pleasuring burst of flavour. Whilst hibernating though, the plant is gradually using up those sugars (via respiration) to keep its cells and tissues in good order. But it isn’t able to replenish them as it doesn’t have the chlorophyll-filled foliage to photosynthesise new carbohydrates. Which is why, come Springtime, stored carrots mostly consist of sugar-depleted packing material, which keeps ’em crunchy, but really doesn’t do much for their flavour. 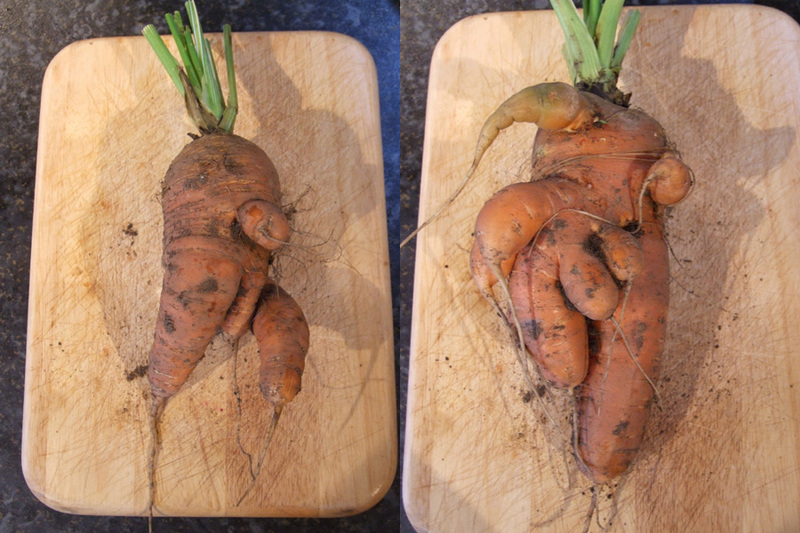 Conclusion: if you want your carrots to taste really, really good, then grow your own is the way to go. Here endeth the lesson. On to this year’s carrot (and other root) growing plan: I’ve read up on the subject, and the general consensus is that what carrots need is super-fine soil with minimal stone content – when a carrot root hits a stone, it grows around or away from it rather than shoving it out of the way, causing forking and splitting you see above (which, when you think about it, is a terribly British way of doing things: “I’m so sorry, were you obstructing me? I’ll just inconvenience myself by going around…”) – that’s still reasonably fertile. But not too fertile, because that encourages the growth of side-roots and yet more forking. 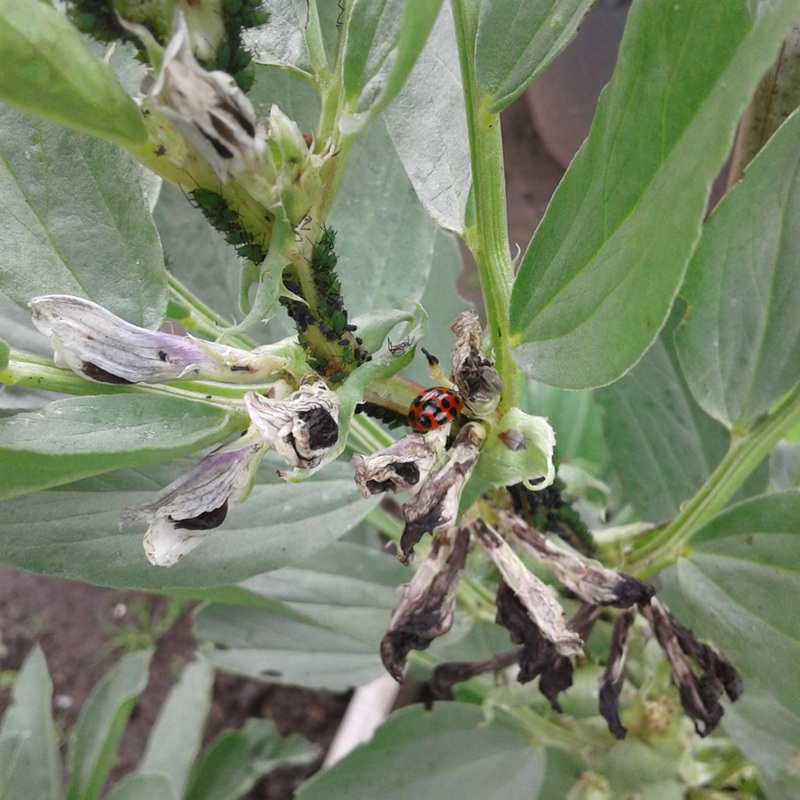 Not that I mind a bit of forking – I’m growing for food, not for show – but they’re quicker and easier to clean if they’re reasonably straight-ish. Next up there’s the dreaded carrot fly to consider: they can smell freshly crushed carrot leaves from a mile away and will zoom on in to lay their eggs at the base of the stems. The grubs will then tunnel into the root and chomp away until it’s damaged beyond all hope of use or salvage. They do have one weakness though: the egg-laying females can’t fly more than 60cm / two feet (or so) above the ground. 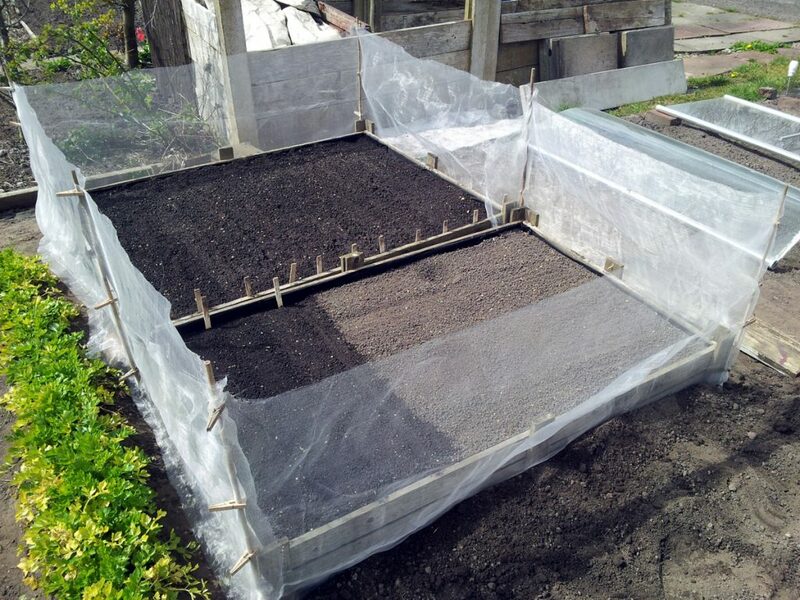 So a barrier of fine mesh around the growing area should be enough to keep them out. 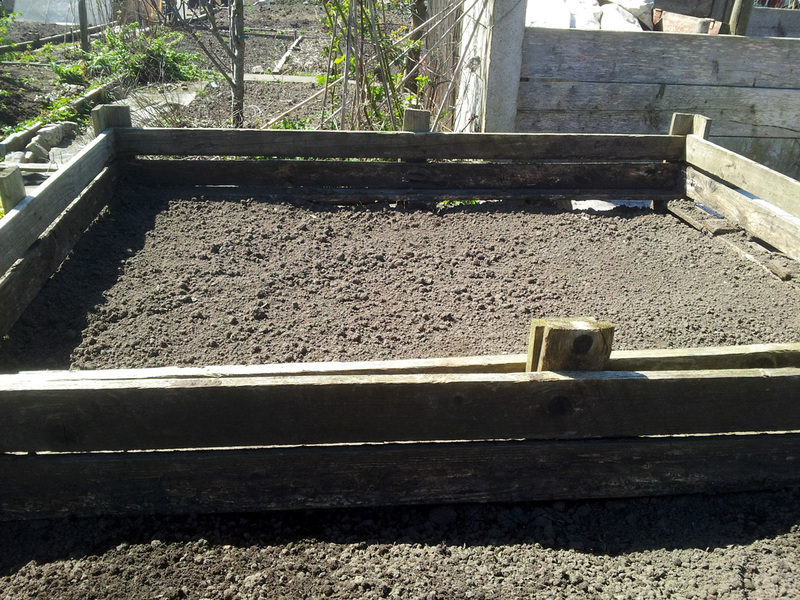 A couple of old raised beds should provide a sturdy framework. Firstly, I forked over and re-loosened the soil in the section I’m using this year – most of which was dug out of the back section when we laid the base for the greenhouse last year – and then relocated a couple of old raised beds (former pallets) that we inherited when we took over the plot. 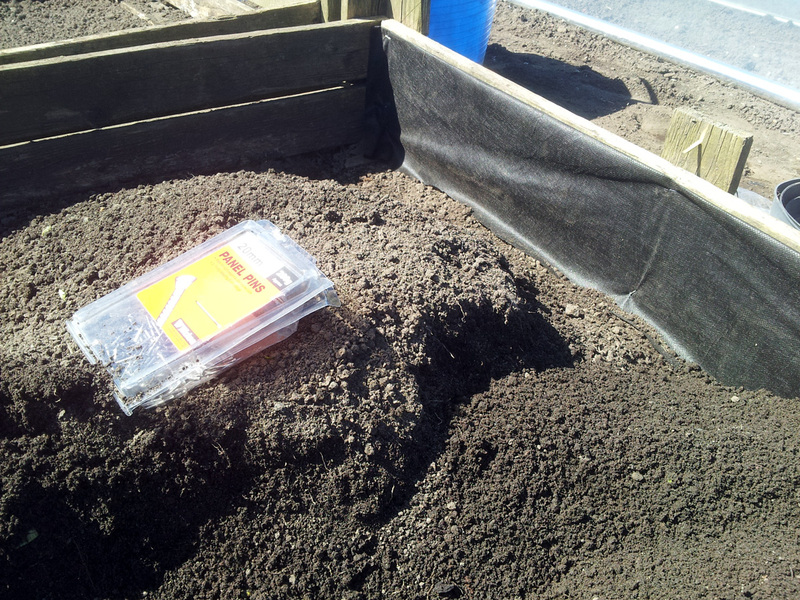 Membrane round the inside should keep out slugs and keep in soil. 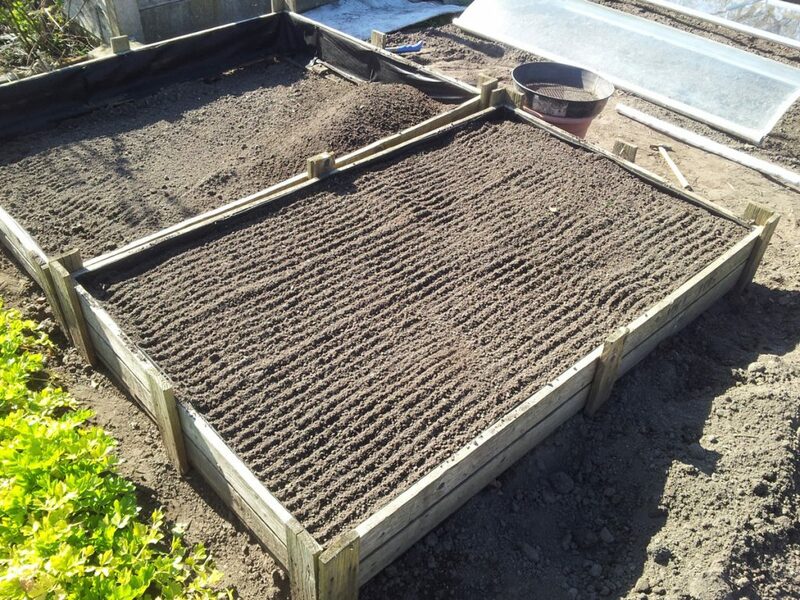 Next, I tacked strips of doubled-up weed membrane around the inside of the beds, to block the gap between slats, which will hopefully keep most of the slugs out and most of the soil in. The biggest part of the job involved bringing in soil from a section in the middle of the plot that I’m levelling to make way for a path, and hand-riddling the lot through a large, metal sieve to remove as much stone and weed root as I possibly can. As you can see, the result is about six inches or so of prime-quality crumb tilth, over a sub-surface of reasonably well-broken soil. Next, I raked in a reasonable amount of fish, blood and bone fertiliser – round about NPK 4-7-4; a slightly higher phosphorus level should aid root growth – and then formed drills in the beds and watered them well. I was going to sow the carrot seed mixed in with fine sand, but the local DIY shop didn’t have any, so I ended up doing without. 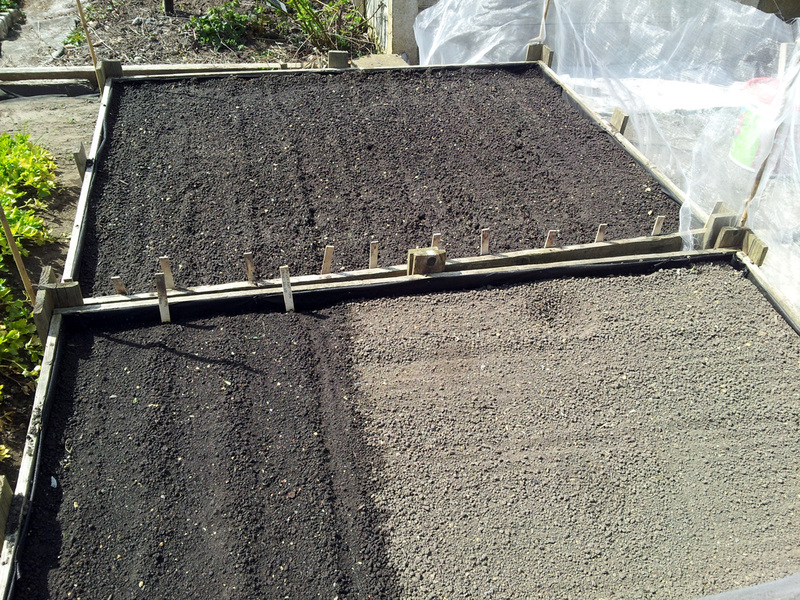 Carrots, salsify and root parsley sown so far, parsnip, mooli and scorzonera to follow. 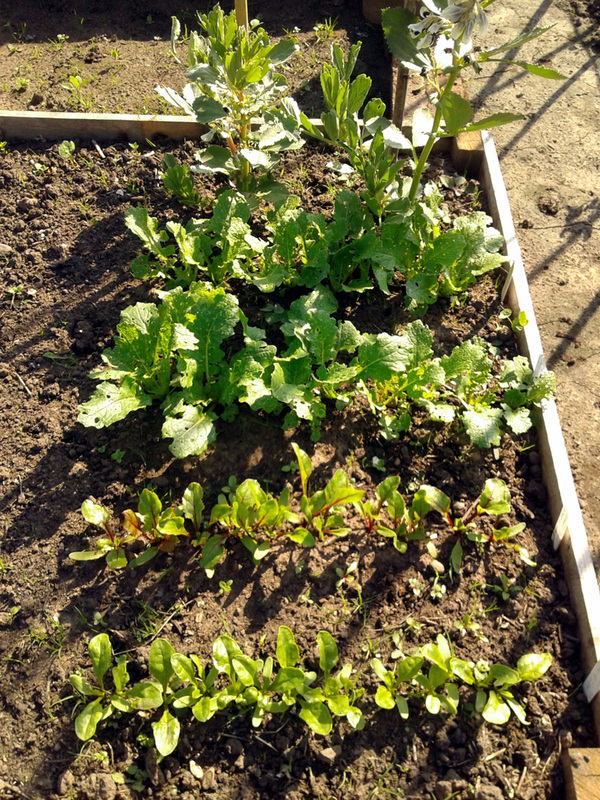 I’ve sown six carrot varieties into the larger of the two beds: ‘Nantes 5’, ‘Royal Chantenay 3’, ‘Autumn King 2’, ‘Charlemagne’, ‘Purple Sun’ and ‘Creme de Lite’. 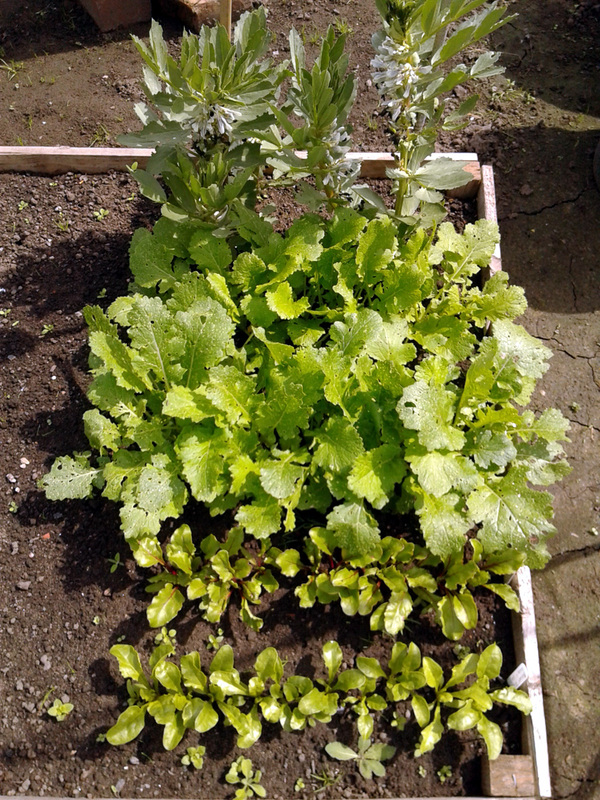 The last two are from James Wong’s Grow For Flavour range (from Suttons Seeds). The Chantenay seeds were sown right along the edge of the bed, to see if they germinate any faster for the soil being extra-warmed by the heat stored in the wooden bed edging. 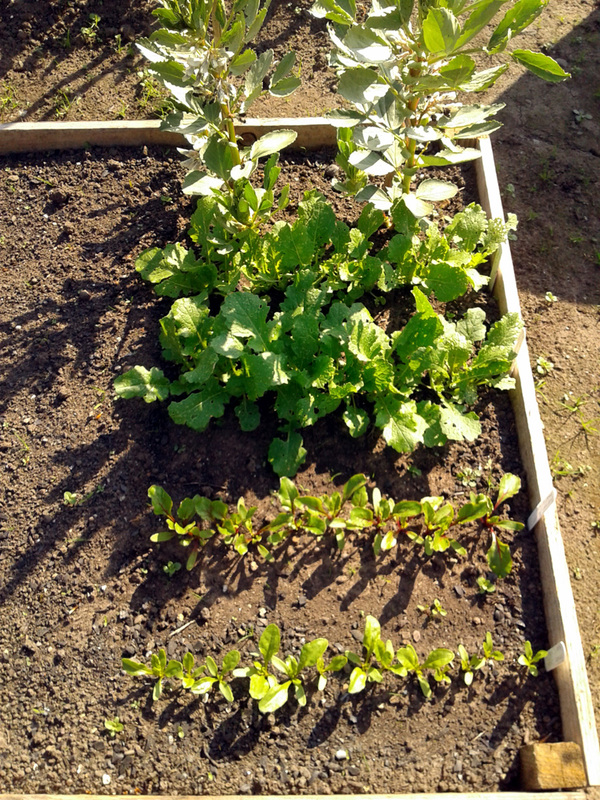 In the smaller bed I’ve sown some other root crops: salsify ‘Giant’ and root parsley ‘Eagle’ (another Grow For Flavour variety) so far. 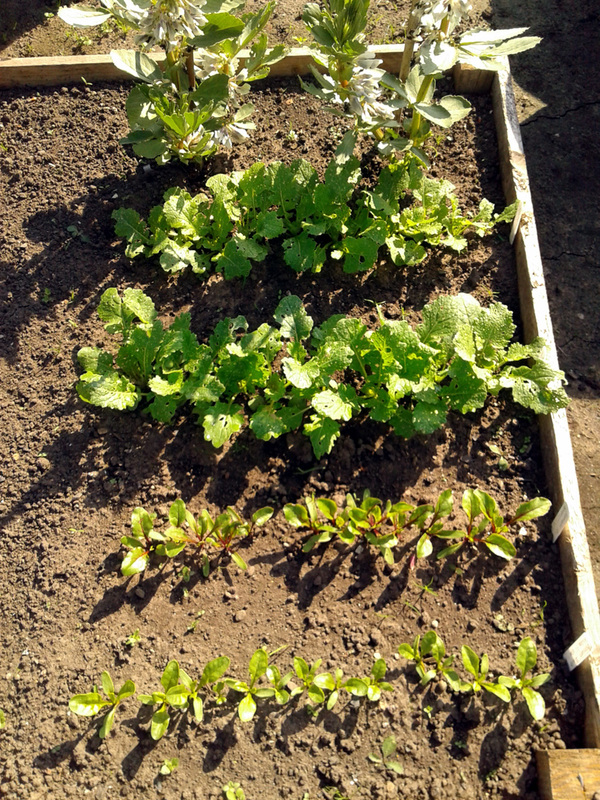 I’ll be adding parsnip, mooli, scorzonera and quite possibly a catch-crop or two of radish at a slightly later date as well. That enviromesh fence is about 30″ high, hopefully enough to keep the carrot fly out. 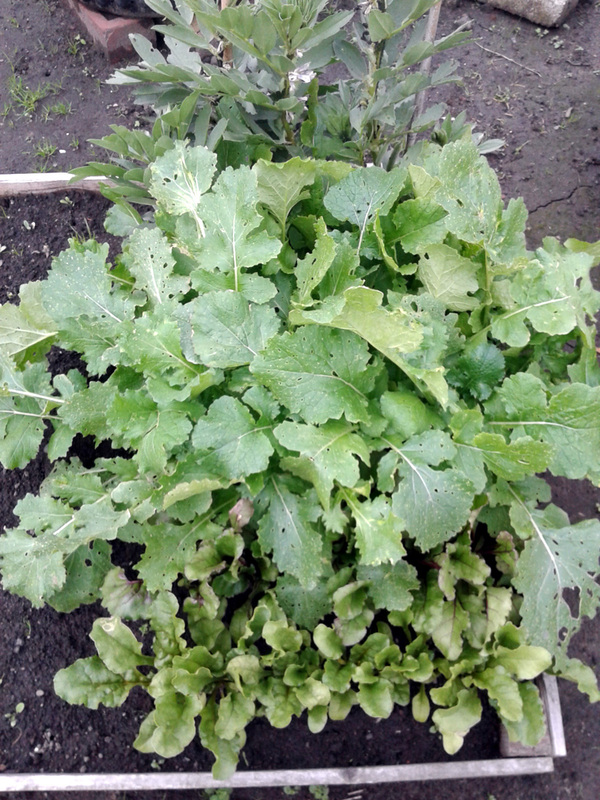 Finally, I surrounded both beds with a screen of fine enviromesh, around 30″ or so in height. It’s reasonably sheltered by the neighbour’s compost bay and fruit trees, so hopefully won’t suffer too much wind-damage, but I’ll have to keep an eye on the pegs, or maybe invest in some cane-clips if they seem to be getting loose. 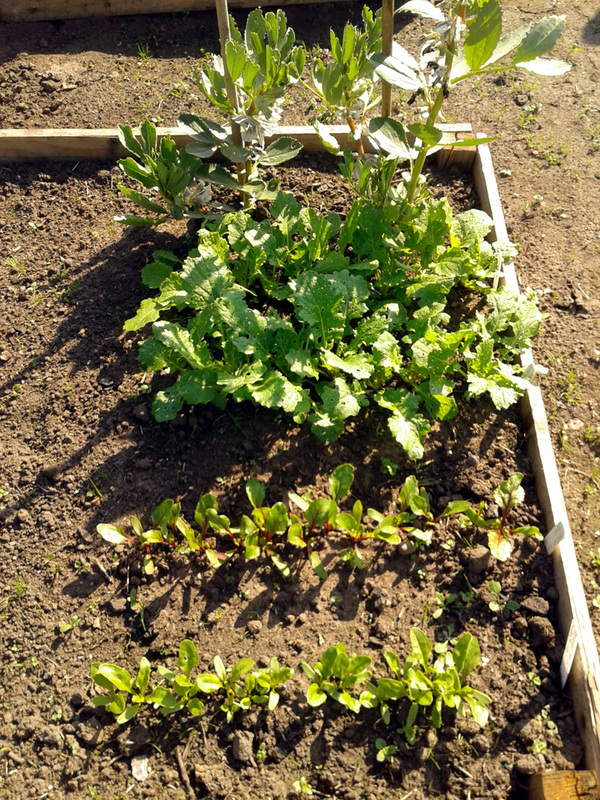 Fingers crossed for a decent carrot crop this year! Because if all of the above preparation doesn’t provide an amenable-enough environment for carrots to grow in, then there’s probably not much else I can do to help.